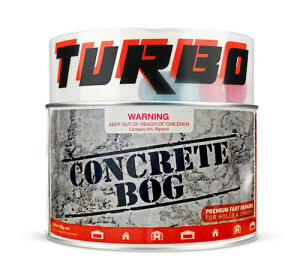 TURBO CONCRETE BOG. Premium Fast Repairs For Holes & Cracks. Mix together the two supplied components, following the instructions about the correct amounts of each. The amount you mix and the proportion of red hardener can vary to suit the job and the speed of cure you want. But it has to stay within the allowable range as written on the tin. » REPAIR DRILLED HOLES, CRACKS OR CHIPS IN FLOORS, STEPS OR WALLS. » SETS HARD AS CONCRETE FOR NON STRUCTURAL MASONRY SURFACES. The ultimate product for all industrial or home repairs. Fill no-longer-used dynabolts in the shed floor or repair cracks or chips in concrete floors or steps. Dries a dull grey colour to simulate concrete. Can be tinted with dry oxides to match coloured concrete. Can also be painted or left uncoated. 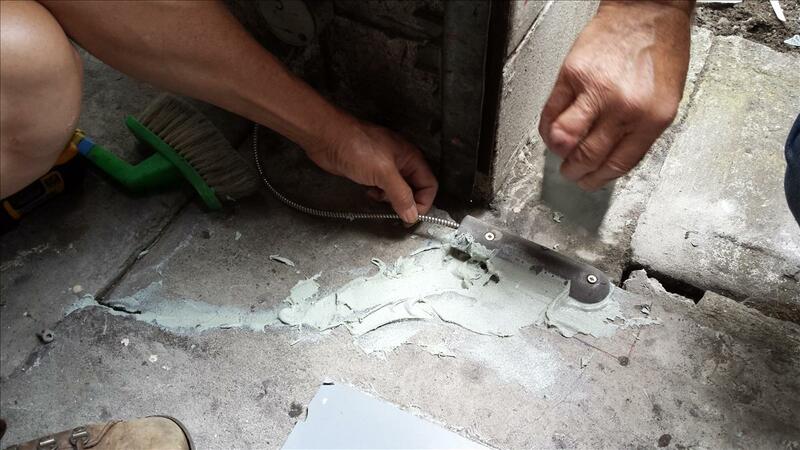 The world’s perfect repairer for all masonry repairs that sets as hard as concrete in minutes. Filling holes and cracks in concrete or masonry products in the past required messy concrete filling or the use of softer filler product. 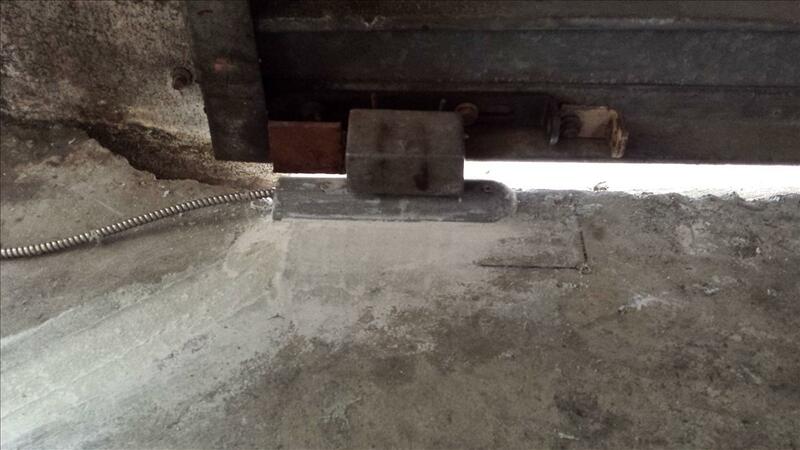 You now have the solution to quickly and neatly repair with the ‘strength of concrete’ and sets in minutes. Water resistant. Incredible strength & adhesion. Mould it, shape it, drill it, paint it. A versatile product with endless uses. A 5 centimetre margin around the damaged area must be cleaned and swept to a dry bare surface. Surface must be clean and dry, free from all dirt, dust, oil, wax, grease, paint and any material which may flake off. Run a diamond blade or masonry drill bit along all cracks to be repaired. 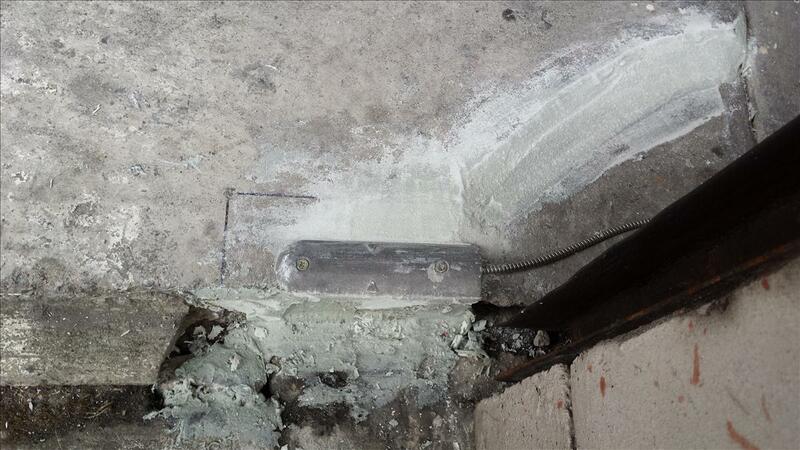 It is necessary to widen the damaged area and chip out sufficient material to allow mixture to penetrate cracks. Due to changes in weather and temperature it is advisable to mix a small portion first to assess the speed of curing. Slightly more or less activator can be used to speed the process up or slow it down as required. Place desired amount of Concrete Bog on mixing board. Add 1% to 4% activator by weight (one level teaspoon of activator to one level cup full of Concrete Bog). THOROUGH MIXING IS IMPORTANT, since the hardener is white and cannot be seen once added. Apply with a steel or plastic spreader. Concrete Bog can be worked in minutes even while still curing by cheesegrating with a chisel or sharp tool to desired shape or contour.